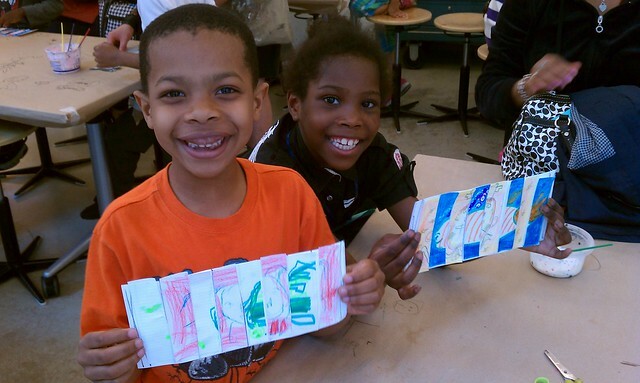 After a semester of hard work in their museum residency, first graders from P.S. 81 excitedly headed to the Children’s Museum of the Arts (CMA). Their purpose: to both explore the gallery as well as create their own art in the studio space. Since January, every first grader at P.S. 81 has been attending art class with Ms. Diana once a week. Each class’s art projects has centered on different fairy tales that students have been learning about in reading class — Hansel and Gretel, Rapunzel, and Sleeping Beauty. The students further explored the characters, setting, and plot of these fairy tales through amazingly creative projects. These ranged from painting watercolor portraits of Rapunzel and the witch to building Hansel and Gretel’s gingerbread house. Some even crafted lifelike hand puppets of Sleeping Beauty and her prince! At CMA, P.S. 81’s first graders toured the Face to Face exhibit, which features self-portraits from students around the world. Our students discussed what they had learned about each person from the portrait, including their age and emotions. After spending some time in front of a mirror studying their own faces, the students then practiced drawing simple self-portraits. On-site teaching artists provided insightful tips for their mini Monets. For example, the eyes should be drawn halfway down their face and a flattened letter “M” is a great start for a nose and mouth. After a portrait drawing warm-up, they split into two groups. One class worked on creating multimedia representations of what they will look like in 100 years, complete with wire-rimmed glasses, fabric-scrap clothes, and white fluff hair. The students then admired each others’ work. Exclamations such as, “You look like a grandma!” could be heard throughout the room. The other class tackled a complex project involving drawing two pictures and cutting them into strips. By alternating the strips, students intertwined the two pictures, creating two completely unique images, depending on how the viewer looks at the piece. The CMA gallery is full of student artwork, and P.S. 81 students were thrilled to learn that their own artwork would be on display in the gallery from June 13 – July 14. The Children’s Museum of Art exhibits the work of all its partner programs throughout the summer, so stop by if you’d like to see P.S. 81 students’ creativity on display! The 5th annual celebration of artwork from CMA’s school partnerships and community programs. The exhibition will host both individual and collaborative pieces created by students in over 20 partnerships, as well as artworks created by the Teaching Artists themselves. CMA’s gallery will become home to a multitude of 2D and 3D projects, including large scale murals, 3D sculptures, pop up books, and a screening room to view films created during the 2012/2013 school year. Viewed in its totality, the exhibition offers a composite of NYC neighborhoods and an emerging generation of art enthusiasts.